If you’ve paying attention to me the past few weeks you’ve noticed I’ve been clicking away at my needles at some sort of project. 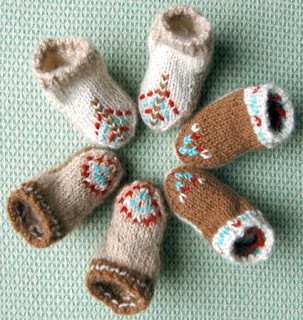 Today I’m going to discuss my final project for my Ethnoarchaeology class which is to knit some baby booties in the Cowichan style. This archaeology discipline places an emphasis similar to Historical Archaeology that text-based accounts should go hand in hand with material goods to create a narrative that might be obscured otherwise. However ethnoarchaeology places a heavy emphasis on active observation with communities that still exist and can offer insight to how their culture functions and the implications archaeologists can therefor place on former cultures. The Cowichan style is an interesting case of how a native people subjected to the advent of colonialism use and adapt new technologies by combining old ones into a new and inspired product. In this case the Cowichan name comes from the Cowichan valley on Vancouver Island. 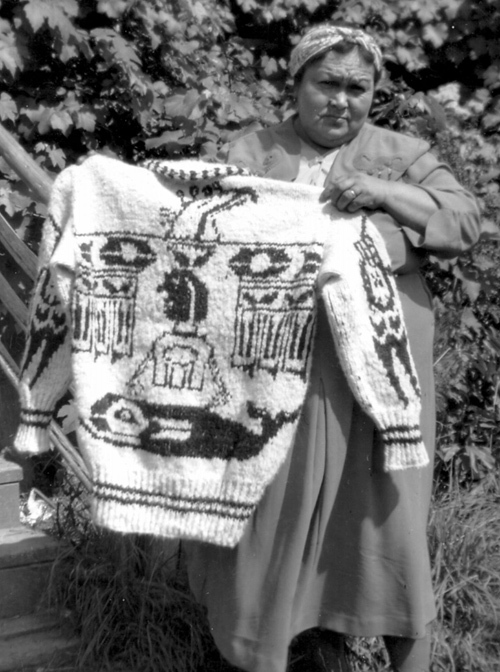 However it didn’t only occur in the areas and the Coast Salish were known to have knitted in the style throughout the area. Coming from missionaries coming into the Vancouver area in the mid 1850’s the Cowichan quickly adapted the new knitting technologies into their new style using an already rich history of basketry and weaving. The Cowichan brand soon became well known across the US and there are known accounts of sweaters being taken over seas for WWII which soon became popular due to their durable nature and ability to retain heat and keep out moisture. Patterns on the sweater were often inspired by past history or even designs that were fancied. One known example is a sweater knitted with a Chinese dragon motif, inspired by an imported tea box. Sweaters in general have a heavily knitted collar and made seamless through knitting techniques. However not all is well with the knitting style, in the process of becoming famous there are many “copy cat” styles that although Cowichan “inspired” are not true items in the Cowichan style. This comes by different seam lines, non-native design and various other little tid-bits such as dyed wool and a different treatment process. This has resulting in native knitters taking shortcuts such as bigger yarn and needles and smaller projects in order to keep up with national demand. Judging by the vast number of knock offs the style itself is in trouble of not retaining it’s native origins. For a more in-depth posting on the Cowichan sweater and where I got some of the pictures from I suggest looking at: http://blog.ounodesign.com/2009/12/21/the-cowichan-sweater-of-vancouver-island/ for more information! This entry was posted in Sources of Inspiration by Kirk. Bookmark the permalink. Kerstin Snodgrass is a 22 year old Archaeological Science student currently in her final year at the UW. Interested in a young age about arcaheology she has strived to continue her studies and eventually start working in the field within the coming year. Although not specialized at the moment her interests mostly include any work with textiles, sewing and knitting with other interests scattered throughout. At the moment she is studying Historical Archaeology, Ethnographic archaeology and archaeology in the public sector. On the sidelines she enjoys arts and crafts and learning French and looks forward to what her future brings. Born in Flordia, she was raised actually in the Northwest from a young age. From youth she gained interest in archaeology first learning about it from her mother's Tutankhamun books and decided to pursue that interest instead of becoming an ice cream truk driver at the age of 8. Her current goals are to graduate with her baceholors and to gain a job in the field hopefully starting with a job in the CRM or be put onto some field schools. There’s a reason we called this tee shirt Cool. I’d love to see images of the finished booties. Would you say that knitting in this style has given you a better understanding of the style itself? The actual booties were adorable – we got to see them in ethnoarchaeology, and I thought they came out really well! What I really liked about what Kirk shared was the current popular use of this style. I grew up in a very small tourist town in North Idaho before I moved to Spokane, and these sweaters are very common as a “country good” that gets peddled to tourists throughout the summer. These sweaters also featured prominently at the Olympics, but integrated corporate logos, so the end result was somewhat gaudy. I had no idea where the cultural basis for this particular item of clothing came from, and it was really neat to find out more!